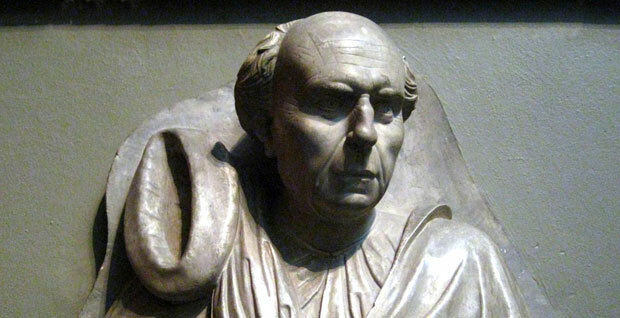 Filippo Brunelleschi was born in Florence, Italy in 1377. Being the son of a notary (a public official), Brunelleschi was also forced to study law in his early age to become a notary but he was more fascinated by arts and decided to pursue the career of his own choice. After getting the training as a goldsmith and sculptor, he opted for the registration in the Arte della Seta and by the year of 1401 he was appointed as the master goldsmith. Along with this he was given literary and mathematical education as well that induced Brunelleschi’s interest in technology which helped him a lot in his career later in time. While serving at the Arte Della, he took part in a sculpturing competition in 1401 but could not win despite the high quality of his work. This led Brunelleschi towards great disappointment and he thought of focusing majorly on architecture instead of sculpturing. Though he did not leave sculpting altogether but architecture became the major area of his professional attention. After getting enough inspiration from his surroundings, Brunelleschi visited ancient ruins of Rome with a fellow companion and studied them in detail. This trip not only added a lot to his personal grooming but also highlighted the long forgotten ruins of Rome and made world aware of their physical presence. He kept working as a sculptor but this trip left overpowering effects on Brunelleschi’s interest in architecture and he adopted the profession permanently with firm determination and devotion. During 1410 to 1415 Brunelleschi made another achievement in the field of mathematics and rediscovered certain principles of linear perspective using mirrors, related to ancient Greek and Romans but long lost during the Middle Ages. This rediscovery was not only a mathematical achievement but it also benefited and assisted fellow artists of Brunelleschi and enabled them to create three-dimensional spaces using two-dimensional canvases. In this technique all the lines seem to be converging and ultimately vanishing into a single point thus creating a revolutionary realism never witnessed or encountered before by the artists of those times. Linear perspective then gradually became a great artistic tool and reached all the regions of Italy and then made its way across the world through Western Europe and is still practiced till date. Filippo Brunelleschi’s other contributions include his military fortifications and buildings across different Italian cities including Pisa, Rencine, Vicopisano, Castellina and Rimini. Brunelleschi also worked on theatrical machinery. His designed machinery was used in theatrical performances in churches and also helped reenactment of Biblical miracle stories. This hoist like mechanism became quite popular in Florentine churches. Another success on his credit is the securing of the first modern industrial patent for his own invented riverboat. He was the architect of the Italian Renaissance who revived many Greek traditions and one of them was the making of stage sets for shows and festivals. Thus, the most famous achievements that won him international recognition were rediscovery and development of linear perspective, the dome of Florence Cathedral and ship design. Along with them he kept pursuing architecture, sculpturing, engineering, mathematics and designing throughout his career. Filippo Brunelleschi kept working quite actively with strong devotion until his death on April 15, 1446 in Florence, Italy.